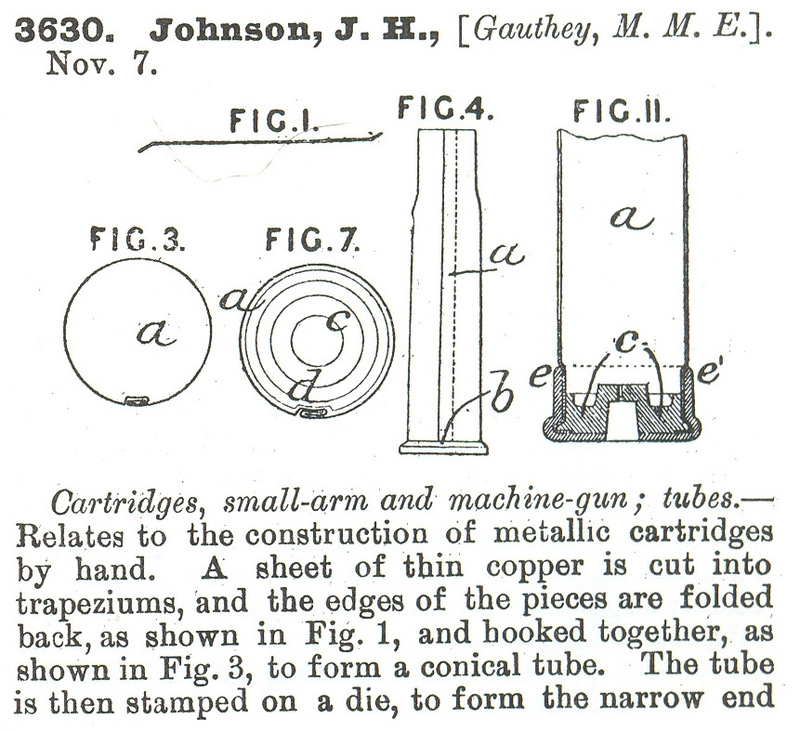 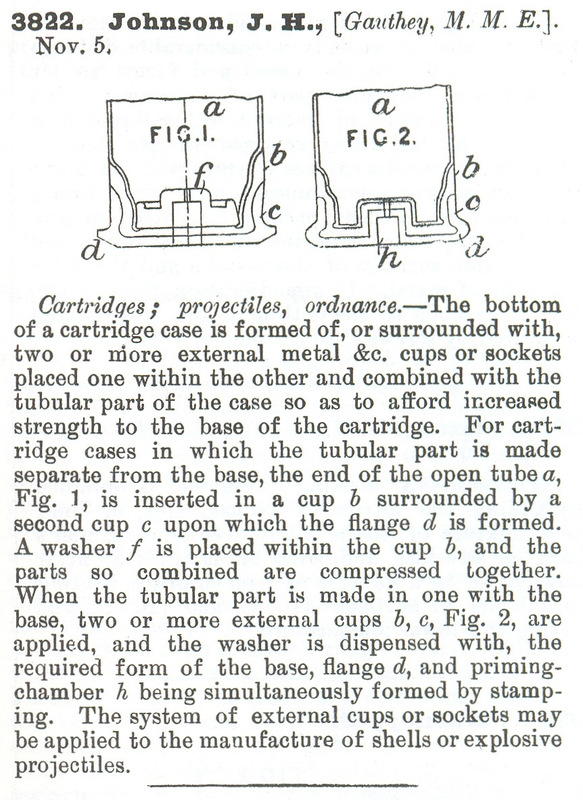 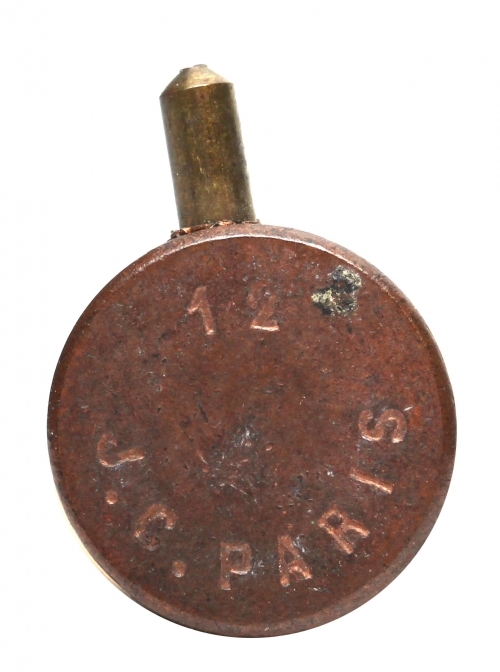 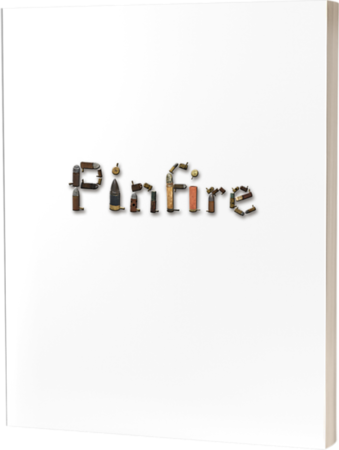 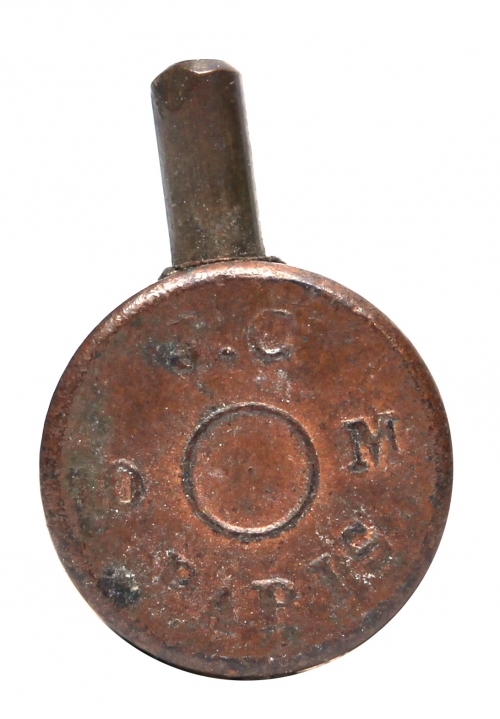 Here are a few pinfire cartridges manufactured by Jullien et Gauthey frères. 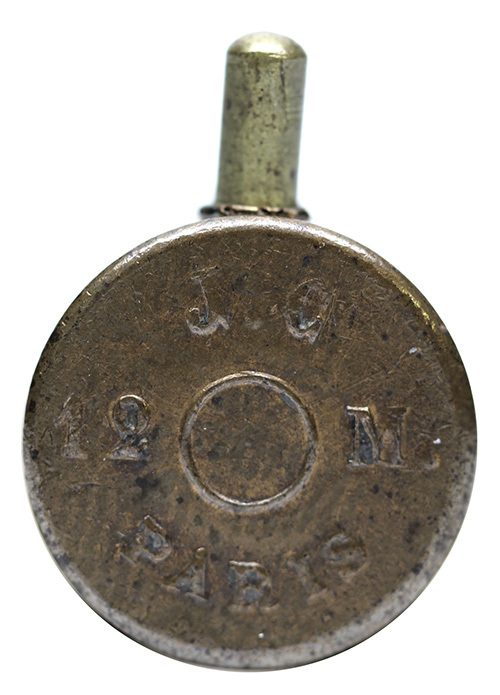 They labeled their smaller cartridge as a 10mm cartridge rather than 9mm which is very uncommon. 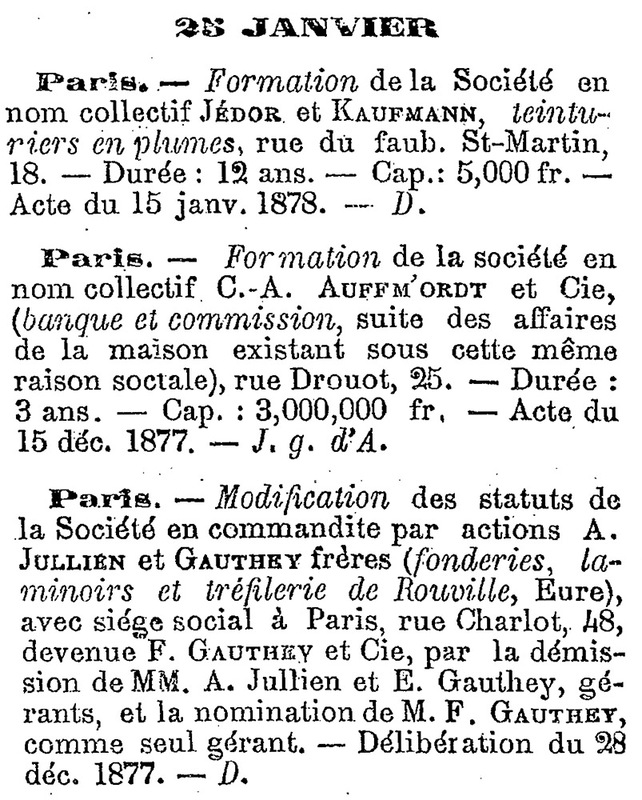 This company was founded by A. Jullien, and the two brothers, E. Gauthey and F. Gauthey sometime before April 15, 1873 which is when they applied for a French patent through their representative, Armengaud, of 45 Rue Saint-Sébastien Paris, France for removing alloys such as soldering, etc., from the surface of metals. 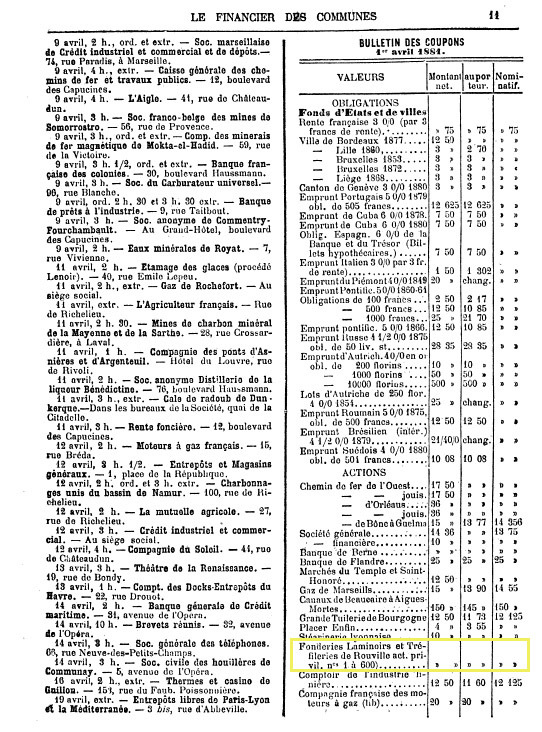 When looking through other patents which list Armengaud as the agent it looks like he mainly represented those filing for specialized manufacturing processes. 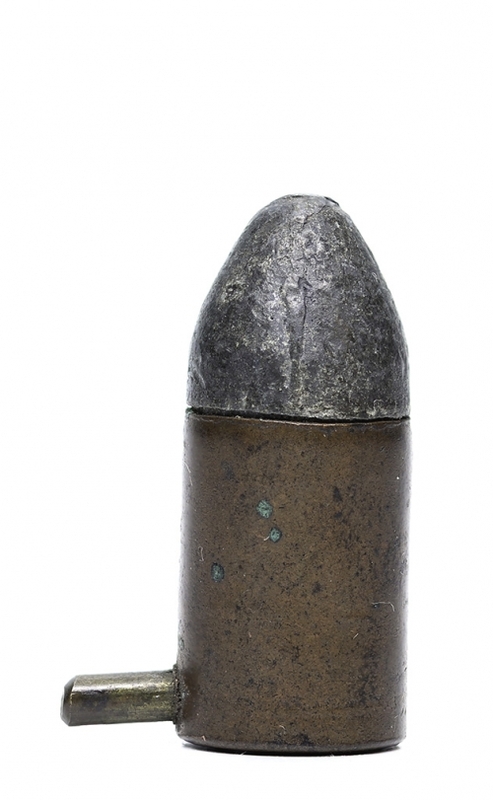 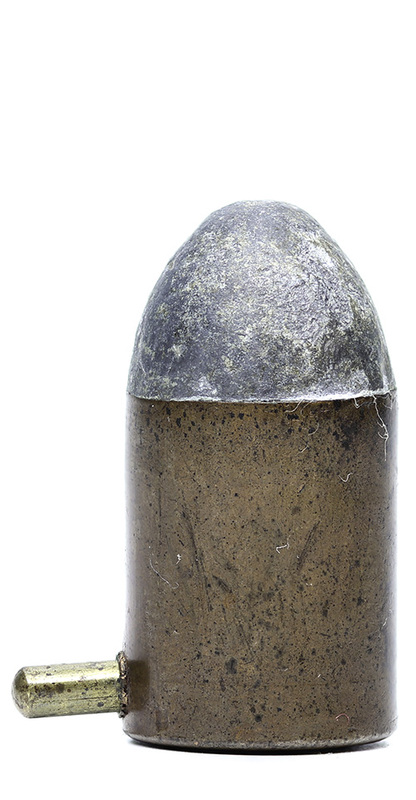 They began making ammunition by at least 1876 when they had a booth right beside Gévelot’s at The Centennial International Exhibition of 1876 in Philadelphia, Pennsylvania where they showcased metallic cartridges. 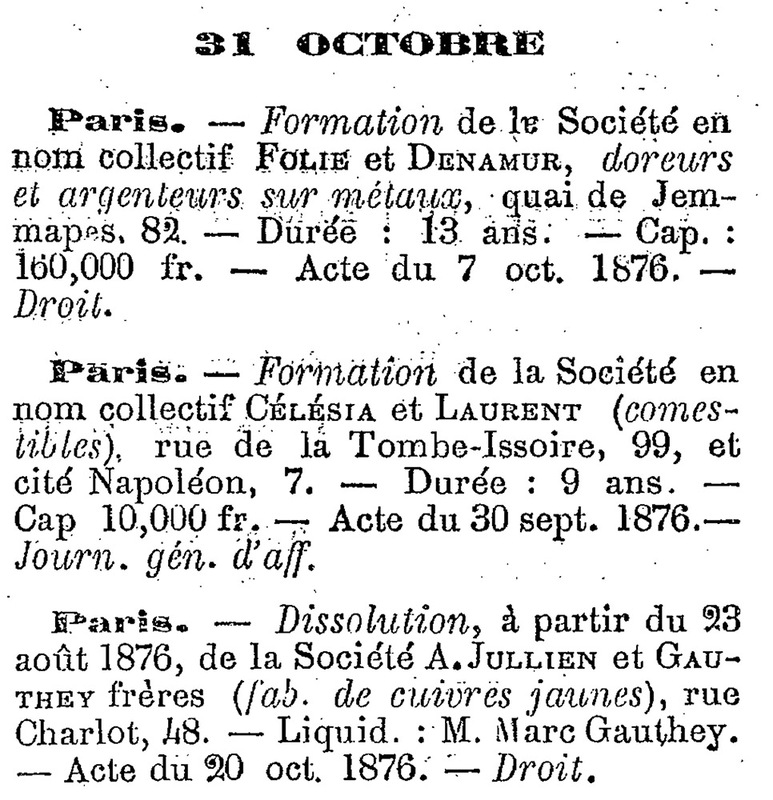 Also during the same year, on August 23, 1876, the company had grown pretty large to where they incorporated as the firm, Fonderies, Laminoirs et Tréfilerie de Rouville and went by the name, Jullien, Gauthey Frères et Cie. At this time each of the three owners were issued 600 equal shares, or one third, of the new company with a profit sharing clause giving them six percent interest, or 15,000 Francs, each year. 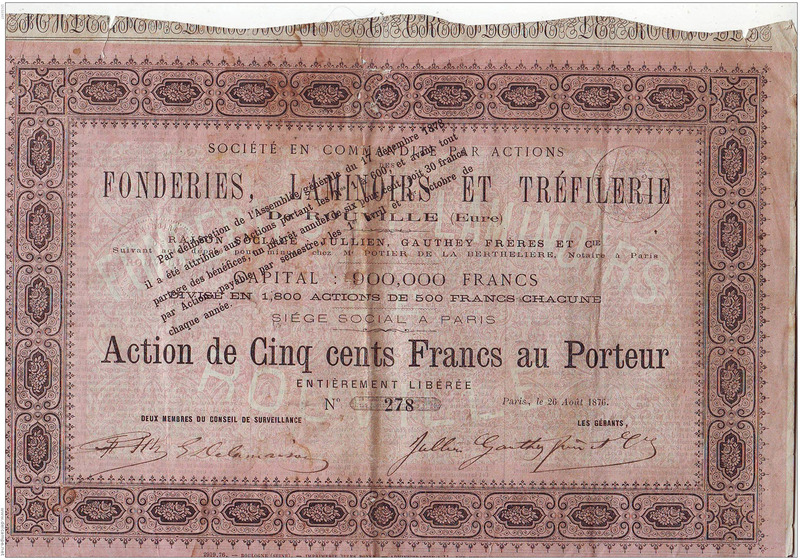 The company listed its capital as 900,000 Francs which is about 12.42 million USD in today’s money. 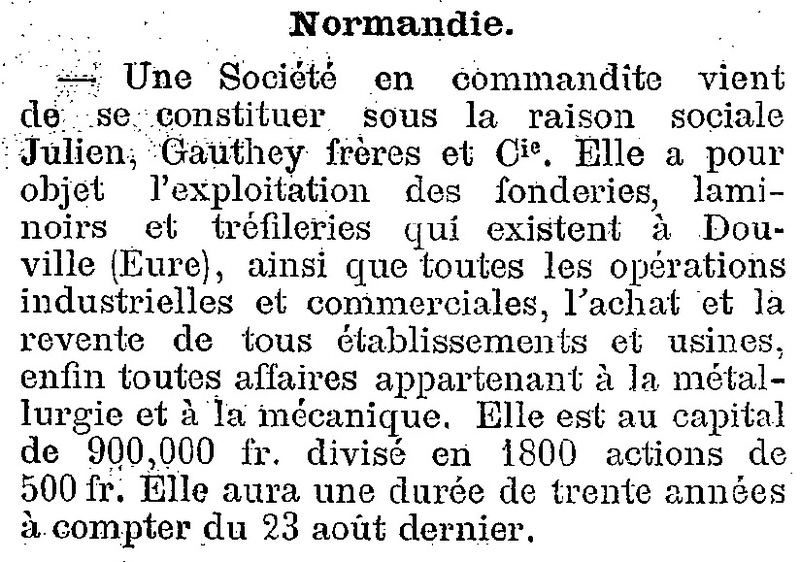 On December 28, 1877 A. Jullien and E. Gauthey both resigned and left control of the company to F. Gauthey with the new company name of F. Gauthey et Cie. E. Gauthey later went into the fabric for dresses industry. 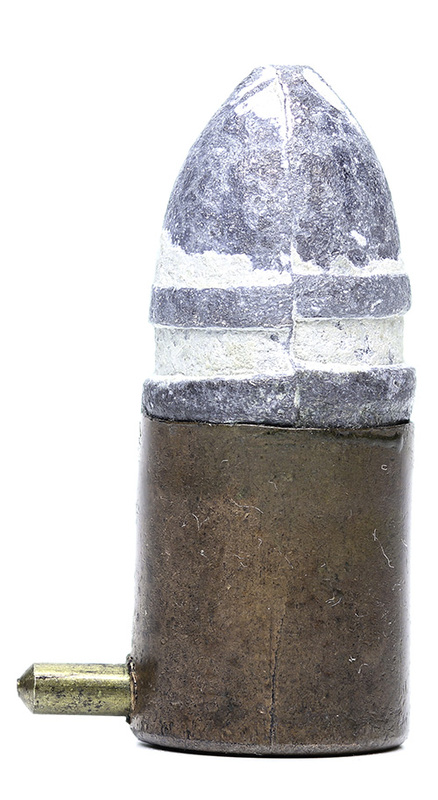 I guess ammunition just wasn’t his thing!